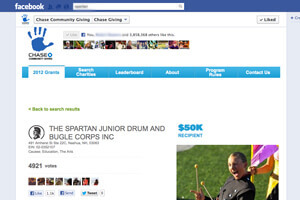 Marching arts supporters have helped four corps organizations come away with a total of $100,000 in grant money as part of the Fall, 2012 edition of Chase Community Giving on Facebook. The top finisher of the six eligible Drum Corps International World and Open Class corps in the campaign was the Spartans of Nashua, N.H. Receiving $50,000 and a total of 4,921 votes, the corps was 43rd on the list of top vote-getting organizations. Spartans Director Richard Rigolini says that much of his organization's success was spearheaded by organization president Paul "PG" LaFlamme who helped the corps reach out to the local community for support during voting that spanned two weeks. "The corps has really started to reestablish itself as a great community team player," Rigolini said. "Not only did the drum corps community help, but our partners in the City of Nashua, political leaders, the Pheasant Lane Mall, the Nashua Boys and Girls Club, local radio stations, and more all just helped. It was a great team effort." Rigolini says the corps plans to replace uniforms and upgrade front ensemble equipment with a portion of the funding they will receive from Chase. Both receiving $20,000 grants were Ascend Performing Arts (parent organization of the Blue Knights) with 3,759 votes and the Mandarins with 2,373 votes. In addition to outreach via the Web and the corps' social media channels on Facebook and Twitter, the Blue Knights worked with several local high school band programs to encourage members to vote for the corps. "We've received incredible support from both our local community and our extended marching arts families," Blue Knights Executive Director Mark Arnold said. "We're extremely grateful for the support. This grant money will certainly help us continue to bring the drum corps experience to the young people we serve." Finishing with 1,346 votes, Music City will receive $10,000 for their efforts. Raiders (254 votes) and City Sound (199 votes) also participated in this round of the Chase Community Giving campaign. Earlier this summer, representatives from JPMorgan Chase attended the DCI Southwestern Championship in San Antonio on July 21 to recognize the DCI groups and affiliate organizations that have received funding over the last three years. Learn more about Chase Community Giving on Facebook.